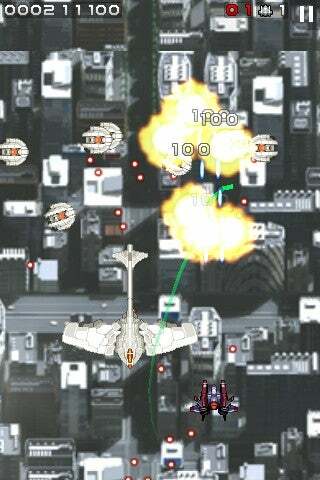 There’s always room for a good top-down aerial shooter game, even on the iPhone. Drawing from such classic inspiration as “1943” and “Raiden,” Glandarius Wing Strike by Japanese game publisher AQ Interactive is now available for Apple’s iPhone and iPod touch. Here, you must save the world from waves of enemy spaceships while dodging increasing amounts of enemy fire. This is accomplished by consistently tapping the iPhone’s touch screen to lay down a stream of laser fire while swiping your finger back and forth to move across the screen. Lasers aren’t your only weapon against the alien scum and you can dodge enemy fire to gain the ability to lock onto enemy ships and fire passively-controlled missiles, which help take out enemy forces while combinations help boost your score. Detailed 2-D graphics, a nice use of graphical layers, good sound effects and an energetic musical score make the game appealing and the old-school arcade feel lives on within the title. Other bells and whistles include a global scoreboard feature to allow you to see how you rank against others, an interface that makes pausing and resuming the game easy and a level select feature that allows you to jump into any level you’ve completed before. This and a consistent stream of glorious explosions and increasingly-intricate robot bosses to take down make you want to play just a little bit longer. Glandarius Wing Strike tries to follow the arcade top-down aerial shooter model but doesn’t quite pull it off with complete success. There’s a lack of weapon upgrades and special moves, commonly found in the top-down shooter genre. The joy of the genre is partly in seeing your spaceship become a nigh-unstoppable killing machine by collecting the items picked up along the way. There’s also a complete lack of an auto-save feature, which seems like lazy craftsmanship at this stage of iPhone application development. Even with these shortcomings, Glandarius Wing Strike is a good way to kill 10 minutes, although it becomes hard to justify the title’s $5 price tag. Great applications and games are released every day on the App Store and without significant updates to round the title out, it won’t be a hard task for a competitor to steamroll AQ Interactive’s effort with a top-down aerial shooter that offers more at a cheaper price.